No celebration is complete without cake and Paper Moon's signature Original Mille Crepe, with at least 20 paper-thin layers of crepe plus vanilla cream in between, is certainly a showstopper. But the Japanese bakery's new creation could just take the, well, cake: Introducing the new Rainbow Celebration Mille Crepe (P2,000), available for a limited time only. 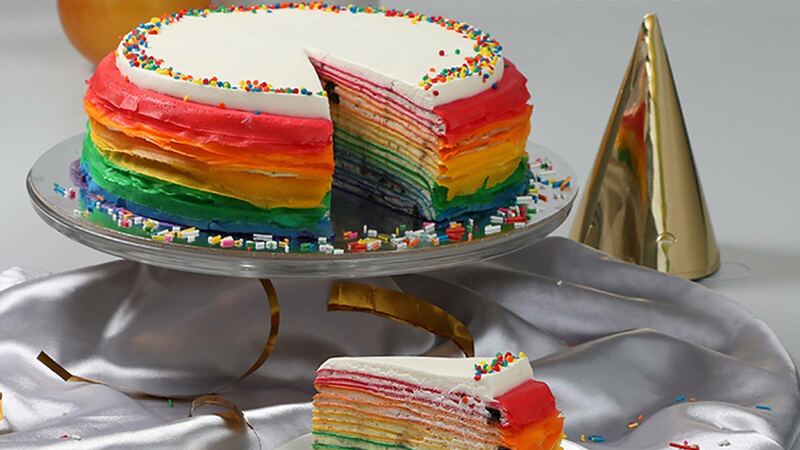 The crepe cake has 20 melt-in-your-mouth layers of crepe dyed in bright colors to create a gorgeous rainbow cake. You can pre-order a whole cake as early as two days in advance, but you can also treat yourself to a slice with a cup of Americano for P250 from Mondays to Thursdays, and turn the most ordinary day into a party. See a list of Paper Moon branches.